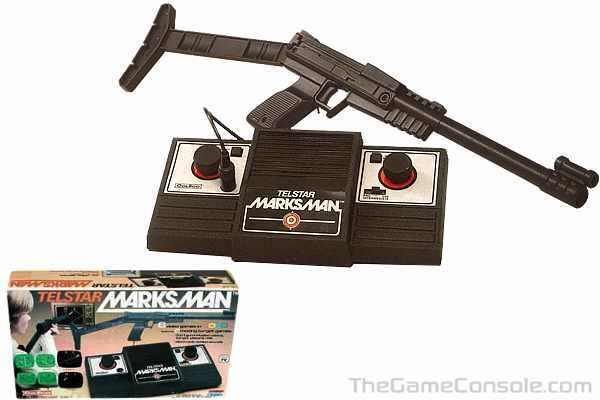 The Telstar Marksman is a first-generation video game console that featured a light gun. It was released by Coleco in 1978. Because it had manufacturer-set amount of games, it is considered a dedicated console. It was part of a series of Coleco Telstar Pong-based consoles; it is essentially a Telstar Colortron bundled with a 3 in 1 light gun and two shooting games. The Marksman light gun is a pistol that features an attachable stock and barrel. It is similar in this regard to the later-released Stack Light Rifle and the Sega Menacer. The elongated barrel included a simple aiming sight. In addition to the light gun, the system featured two paddle controllers built directly into the console. Its reported features included on-screen digital scoring and three different difficulty settings (beginner, intermediate, pro). It required two nine-volt batteries or Coleco's Perma Power AC adaptor to power the system.